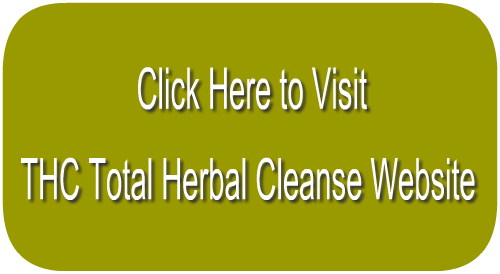 Overview – How Can ‘THC Total Herbal Cleanse Help You? Guarantee: If you are not satisfied with the product, you have 15 days to claim of 100% refund. THC Total Herbal Cleanse may slightly increase your chances of passing urine, blood and saliva tests. THC Total Herbal Cleanse is one of many detox products designed to cleanse your body from THC in order to pass a drug test. 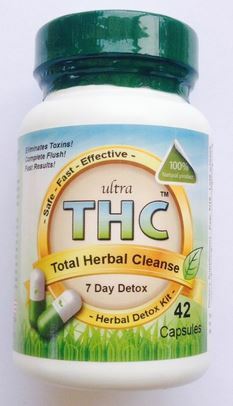 The Seller, “THC Total Herbal Cleanse”, claims that this product is more effective than any other product on the market. However, we have not seen any proofs of this. It is imperative to note that the Seller, “THC Total Herbal Cleanse”, states that these detox capsules are only sold to individuals seeking complete body detoxification to pass at home self-administered drug screen tests. So, if you use this product to pass an actual drug test, you do so at your own risk. The seller, “THC Total Herbal Cleanse”, states that the product was designed for users with light, moderate and heavy toxin exposure. Time to detox is 7 days. 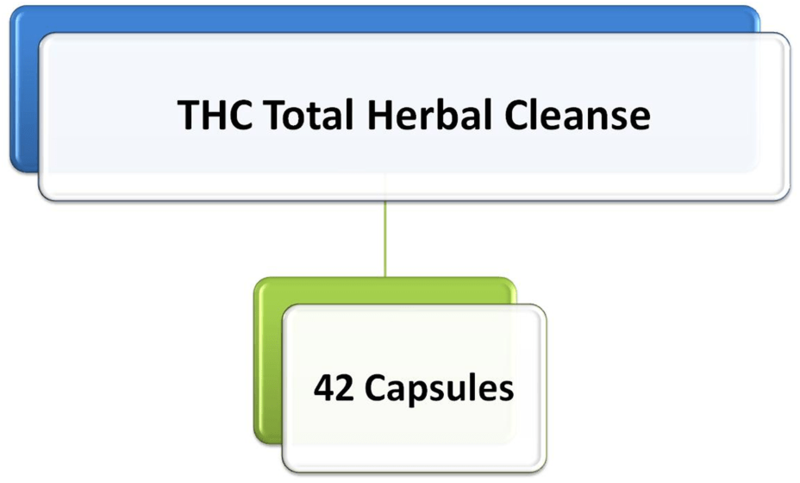 THC Total Herbal Cleanse consists of 42 capsules. Herb Blend: Organic Burdock Root, Organic Dandelion Root, Organic Rhubarb Root, Organic Goldenseal, Organic Sheep Sorrel Herb, Organic Cat’s Claw Bark, and Organic Pau D’Arco Bark. • Take 2 capsules 3 times a day. 2 capsules in the morning, 2 at lunch time, and 2 before bed. • Start the detox program in the morning when you first wake up. • Can be taken with or without food. 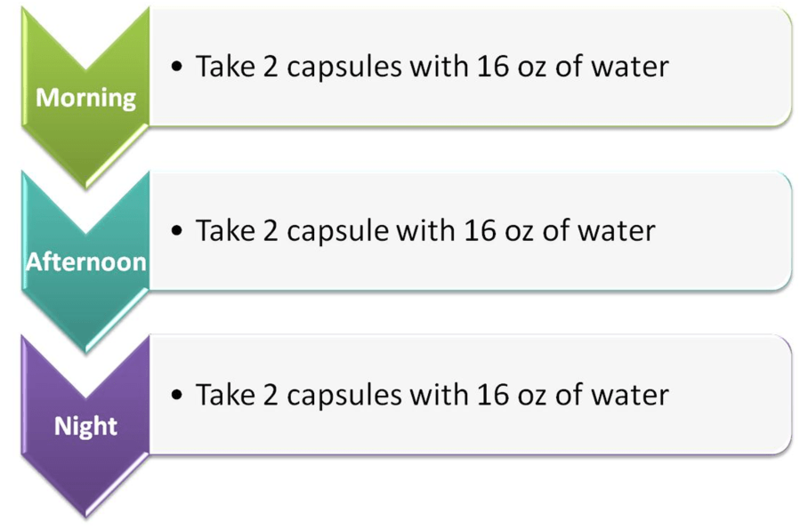 • Make sure to drink 16oz of water with each 2 capsules. • Drink large amounts of water and/or cranberry juice during the 7 day detox period. • Eat a low fat healthy diet with lots of fruits and vegetables during the detoxification process. • Do not smoke marijuana during the detox process or be around secondhand marijuana smoke. 1. THC Total Herbal Cleanse may slightly increase your chances of passing a urine, blood and saliva drug test only because some herb components have diuretic and laxative effects increasing whole body detoxification. 2. Seller offers 100 % refund within 15 days of purchase if you are not satisfied with the product. 3. The Seller respects your privacy and ships your order in an unmarked package. 4. All components are 100% natural, only consisting of organic herbs. 5. 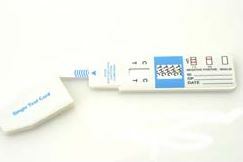 You can order the product overnight, if you have your drug test within a couple of days. 1. The product is not designed for an actual drug test. 2. Results vary from person to person. Factors that play a significant role in test results include body weight, life style, individual metabolism and how often and how much marijuana is consumed. 3. Unlikely works for the heavy users. 4. You must follow the instructions explicitly if you want to increase your chances of passing your test. THC Total Herbal Cleanse website provides customer service via Live Chat and Phone line. We do not have information as to the quality of such service. We found only 2 positive reviews on amazon.com and no other information on other blogs so far. We have seen only positive feedbacks on the Seller’s website; which, in our opinion, may not be completely objective. If you want to try a new product to pass a drug test, you can experiment with THC Total Herbal Cleanse at your own risk. It might be useful if you want to detox your body from accumulated environmental and food toxins. Have you tried THC Total Herbal Cleanse? Let us know what you think! Dave..Thanks for your feedback. It will be very helpful for other users if you can provide more details about your smoking history as it is not clear why this product was effective enough in your case. I started the detox program but I wasn’t able to take all the dosages within 7 days. Will it still work if I finish the within 2 weeks? Maria..So far, we have found only 2 reviews on amazon.com and no other information on other blogs. So far we have seen only positive feedback on the Seller’s website; which, in our opinion, may not be completely objective. This is why it is tough to say how effective THC Total Herbal Cleanse program will be in your case. 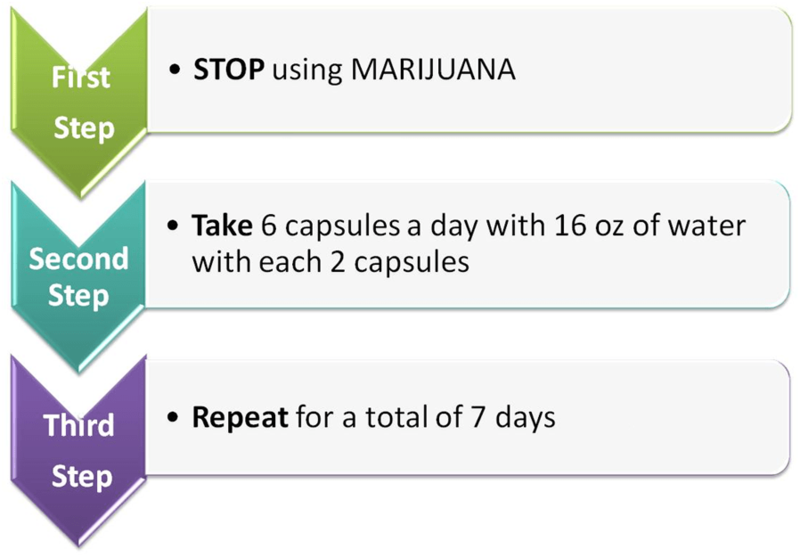 After completing this program, I would recommend checking your THC levels with a home urine drug test. This will show how effective THC Total Herbal Cleanse was in your case. Hi I’m stephanie does this product really work? I have a drug test on the 11th coming up? Maggie..Regarding your refund question, please contact the Seller of the purchased product directly. John..Sorry to hear about your bad experience with using this product. If you need help with your drug tests in the future, send me your details like Bio, smoking history for the last 3 months and life style and I will be able to give you some recommendations to hopefully avoid this next time. Sorry for your current situation. Are you able to drink while taking these? Anonymous..During any detox program it is highly recommended drinking large amounts of water and/or cranberry juice and avoiding consuming alcohol as this might alter the detox program effects. MagicJ..Sorry to hear about your bad experience with this product. We gave this product a 2 star rating as we have seen only a few positive reviews about THC Total Herbal Cleanse. You can check other products reviews for heavy users here. Worked like a charm. Make sure to use it correctly, eat low fat diet and exercise. Ive failed many before. This product helped and I feel better. 200lbs 3x a week smoker of grape ape and green crack oil and bud strain. Thanks guys. Forrest..Thanks for sharing your story. I am glad that this product worked for you. I’m 150 pounds, 5’9″, and a daily smoker of wax for years. This product did not work for me, I took an at home test and failed. Joey..Sorry for your bad experience with this product. You might read more details about other more effective products on the market here. Walt..Thanks for your feedback. It is great that it worked in your case. Unfortunately other heavy users were not so lucky. Mike..Thank you for your feedback. I am glad that this product worked for you. Been using detox products for 11 years. This is the only one I trust now. Its not a quick fix but it works. 7 days and you are clean. Great price also. Thank u again!